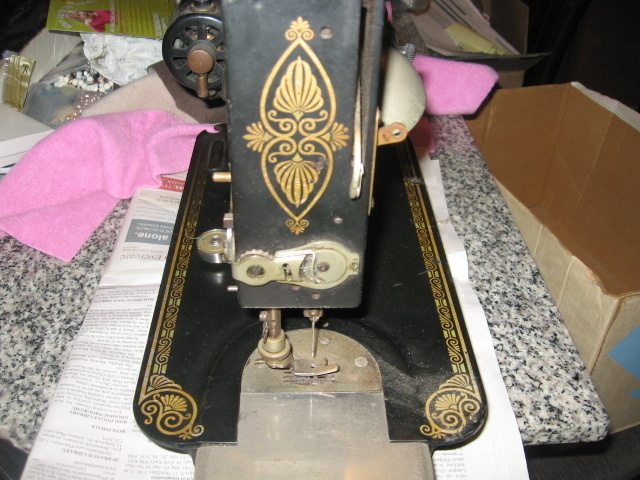 In Sewing > Non-Singer Sewing Machines > Show & Tell. I know nothing about this machine. Can it be restored to working order? I need a place in Boston, MA if anyone knows the answer to my question. This machine is a White Rotary. Do you have the cabinet or case? It looks like it should be able to be returned to a treadle, although it has been an electric machine. This machine is a Florence Rotary which later became White Rotary the value is whatever someone thinks its worth , retail wise very little , I own one it works perfect but I had to alter the cord because it frayed so I spliced it. These are such beautiful machines but they are almost always worth very little, from a few dollars to about $50. Of course, anything is worth what the buyer is willing to pay for it. I recently purchased a Florence Rotary in a simple oak case for $50 at a thrift shop. Turns out I paid too much, based on the market I've been researching. Not only that, but the bobbin holder is missing, so I can't even sew with it. 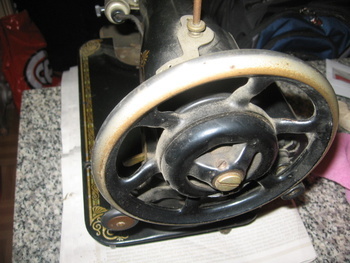 The irony of these old machines, versus the new ones, IF you are a real tailor or seamstress, is that they will do almost any stitch, almost any task, because the maker assumed the home sewer would like to make garments & housewares instead of buying them in stores, but the products should look like they came from stores. So you can do amazing things, even with the oldest of Florence Rotarys. There are many things I don't know about relating to the box full of attachments that came with the machine, but I do recognize some of them from my days working in the garment industry. I absolutely must get a bobbin casing. Just running the machine without thread & hearing the sound of the wheel & feeling the smoothness of the motor makes me want to start sewing an entire wardrobe! I'm no expert on the machine & there are so many others like it, other brands, other models, other patents & years, but to address your question, it looks like you might have a little rust there. If you really want to sew with it, I'd have it overhauled. There are many craftsmen out there, although they are dying off as quickly as watchmakers, but they can tell you everything & do everything you need. 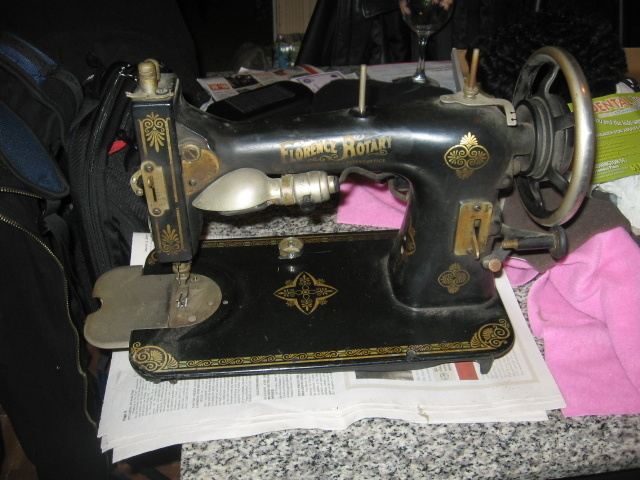 If you don't want to sew with it, you might sell it for parts to someone like that aforementioned craftsman, or on an auction site. I know I'd pay a reasonable price for a bobbin holder right now!!!! 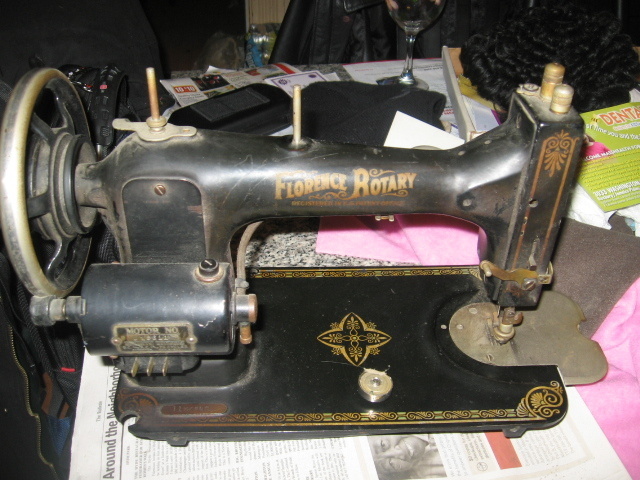 An elderly woman gave me a florence rotary sewing machine. It is in a carrying case. I looked at it and asked her "how does this work, it has no electric motor on it. No cord, nothing." She didn't know. How is this old machine suppose to work? I can turn the hand wheel by hand. and everything turns, (has a round type belt) but how can one sew and turn the wheel at the same time. Anyone have any information? boopsie53 the machine isn't complete by the sound of it. either it should have an electric controller foot and plug, or it should have a handle. it's probably a treadle head that's been put into a portable case. There is not a motor on it so maybe it is a treadle head put in a portable case. But when I looked again I can not see how that can be either. The small round belt is hooked so the machine can be turned by hand and it moves everything. It looks like it belongs in the case. Thank you so much for responding to my questions. I means someone gave it to me so I am not out any money.